This post comes to us from Robin MacFarlane of That’s My Dog! in Hazel Green, WI. Robin is a fantastic dog trainer, speaker, and mentor; we are very lucky to have her contribute to our blog. Enjoy the article! 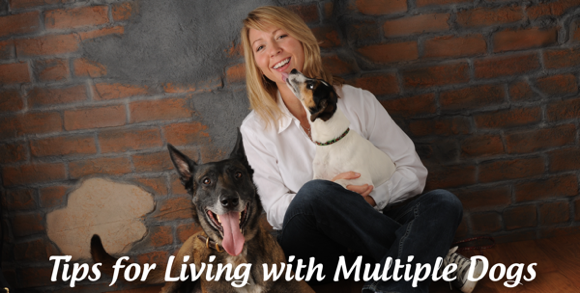 Lately we have been getting an increase in calls regarding problems in multi-dog households. Often we hear that one dog is *suddenly* becoming aggressive with the others and causing fights. Without exception, a lack of human leadership in the home is the primary cause of the problem. What seems sudden has actually been a building problem, but the symptoms went without notice. In an effort to help a dog * be happy* many people add more dogs to the household for companionship. However, there is often surprise when this addition creates tension and chaos rather than a play buddy. It is true that lots of people live with two or more dogs without difficulty but that success is due to their ability to convey structure and rules to their dogs (whether they realized it or not). The key to living successfully with multiple dogs is understanding their needs and motivations, as well as how those things work in a group dynamic. In short, dogs that are allowed to create their own rules and structure are not going to set up a nice little democracy where sharing and fair play will be the standard. Unfortunately is doesn’t naturally work that way with a group of dogs. Well, it doesn’t always work that way in human groups either……at least not without someone being in charge. Animals will covet resources. For our domestic dogs the resources are food, toys, you and space. Armed with the knowledge of what is important to your dogs, you can now establish routines of living together and maintaining the peace in your tribe. Here are a few thoughts on the types of routines to fall into. * Adequate exercise: Dog’s that have pent up energy are going to be prone to frustration (which leads to scuffles) Make sure your dogs get adequate exercise in the form of structured walks/jogs on leash with you. Too often it is assumed that having one of more dogs will mean the dogs will entertain one another by playing in the back yard. While this may be true, it does not replace the responsibility and value of walking the dog. * Control feeding time: Many fights start around the food bowl and during feeding time. Feed each of your dogs from his/her own bowl rather than expecting them to share. Put down the food (feeding the calmest dog first) and remain in the room to ensure no one is attempting to steal someone else’s ration. If this is not possible due to your schedule than consider separating the dogs by using crates or different rooms. Dog’s should be allowed to eat without feeling they need to defend or guard their meal. * Take charge of space in your home: Dogs are very spacial oriented. *Territory* such as the couch, the bed or access to the front door, should be something you control rather than your dog. If you allow your dog on the furniture, be aware of potential problems and watch for dogs who begin to defend that space. Growling, lip lifting, baring teeth, etc. should be nipped in the bud at the first sign. These behaviors indicate your dog believes he/she has the right to warn off others. If you mistakenly excuse the behavior it can escalate into fights down the road. You may need to remind yourself that it is; Your Couch, Your Bed, Your Front Door…….rather than your dogs. It is easier to keep perspective on the appropriateness of Fido’s actions when you take this viewpoint toward his/her behavior. Dog’s can also begin to become possessive of you and it is not uncommon for one dog to growl when another comes near you. This is often interpreted as *he/she is jealous when I pet the other one*. Jealous isn’t really the right emotion to attach to this type of behavior. Imagine if your dog could speak. Rather than growl, you would hear him/her saying, “Hey Dog, back off, that is MY human!” Does that sentence change your perception of what is going on? It should and your response to such behavior is “Quiet Fido” I have the right to pet and play with which ever dog I chose in this house……cause after all, I pay the mortgage. Living with a group of dogs can be delightful. But it is a responsibility. Sometimes it is easy, sometimes more challenging. The dynamics are going to depend on the individuals that make up your group. Pick wisely as you add new members to your household, establish boundaries and rules early on and find professional help if you are currently struggling with one or more of your canine companions. If you enjoyed this entry, don’t forget to visit the website of That’s My Dog! If you are a professional working with dogs and would like to be considered as a guest blogger on this site, please contact us.